common to every person in every walk of life. and you may never get where you want to go. Gain everything you'll ever need in life... For life. For almost 60 years, we've provided vast resources to help our customers improve their lives. Today, we are giving you what is essentially the culmination of all those years in business. It gives us great honor to present 50 of the greatest minds in personal development. These 50 experts and authors give you the information and motivation you need to be genuinely happier and more successful each and every day. Fundamental One: Gain an Unshakable Confidence and a Glowing Self-Image. This first key practically carries you to your goals. Fundamental Two: Improve your Health, Strength, and Energy. Maintaining a vibrant, disease-free body is essential. Fundamental Three: Achieve a Rewarding Career with Ironclad Job Security. Find meaningful work and become indispensable. Fundamental Four: Find Financial Freedom. Can you already feel the stress leaving your body? Fundamental Five: Enjoy Satisfying Relationships. The more people you have who love and respect you, the happier you are. These Five Fundamentals build on one another to help you form a complete life that's nothing short of extraordinary. Because once you focus on these fundamentals, in no time at all, you become a more positive, focused, and determined person. You become optimistic and creative. You begin to activate all the powers of your mind and organize all the mental laws to work on your behalf. You step on the accelerator of your own potential, and you begin achieving at a higher level than you ever have before. Today these Five Fundamentals are presented by 50 leading achievement authorities in a extraordinary library. Simply listen, and they'll help you to become 100% fulfilled. Remarkable Perspectives Designed to Make Your Life Extraordinary. The 12 most listened-to Audio Sessions you will ever listen to, today, tomorrow, for your better life! 50 minds and more than 50 years in the making! You enter and sit front-row center. Within seconds, the great Denis Waitley suddenly appears on stage. In a style only he can deliver, he shares with you key information that will have you excelling in today's world. And as soon as you jot down a few notes, he exits the stage and tosses the microphone to Dale Carnegie, a legend in personal development. Dale wastes no time and delivers only his best achievement strategies. He knows your time is valuable. And just when you are at the edge of your seat wanting more, he exits stage left. Before you have time to applaud, Marianne Williamson delivers a touching anecdote that changes your perspective on life. For hour after hour, each success legend shares his or her most coveted success secrets, key ideas, strategies, and action plans! Jim Rohn, Brian Tracy, John Cummuta, David Allen, Dan Sullivan, Mark Hyman, M.D.. And dozens more! Each boiling down sold-out appearances to the five or six minutes that most impact your life. You'll be among the few who have the rare privilege to hear these exclusive interviews, live appearance excerpts, and real step-by-step strategies to enhance your life. These 50 legends hold nothing back. Throughout these 12 complete Sessions, you'll listen to ideas as fresh and powerful as they are timeless and eternal. Featuring Denis Waitley, Paul Pearsall, Ph.D., Michael Wickett, Stephen Edwards, Earnie Larsen, and MORE! Michael Wickett: We give you permission to shed yourself of any emotional baggage you might be lugging around. Then, Michael reveals how to finally erase all the guilt that's eating at you... in JUST SECONDS! You bet you'll breathe a huge sigh of relief. Stephen Edwards: Overcome fear and live positively. Every day! This one piece of advice will impact your career, your relationships, your health, and your happiness. Paul Pearsall, Ph.D.: Paul presents 6 powerful words that become your unwavering philosophy to enjoy a simpler, more fulfilling, more abundant life. Featuring Brian Tracy, Earl Nightingale, Michael LeBoeuf, Ph.D., Rick Ott, Jerrold Mundis, Tony Manganiello, and MORE! Michael LeBoeuf, Ph.D.: Discover the 3 simple steps to getting exponentially more done and realizing far greater results. Plus, learn the 2 common time traps you must sidestep that slam the brakes on your personal and professional progress. Rick Ott: You are just 4 steps from tapping into your own deeper levels of creativity! Imagine being THE ONE in your organization to champion the best, most profitable ideas. Jerrold Mundis: Has your pay remained the same or even decreased over the past couple of years? You're not alone. Jerry shows you just what to do to finally break your pattern of under-earning! Yes, it even works in today's economy. Featuring John Cummuta, Joe Caruso, Tom Peters, Earl Nightingale, Deremiah Phillips, and MORE! John Cummuta: Tens of thousands of people will lose their job next month. But NOT YOU! Because John Cummuta has 3 sure-fire ways to make you flat-out indispensable in the eyes of your boss and colleagues. Tom Peters: Tom hands you 7 critical tips to give yourself an edge in today's constantly changing business environment. This must-listen advice keeps you competitive in today's unforgiving job market. Featuring Richard Koch, David Allen, Jim Warner, Ric Edelman, Terry Lonier, and MORE! David Allen: Get TWO, THREE, or even FOUR TIMES more done... in just TWO MINUTES! Yes, you read that right. David reveals his Golden 2-Minute Rule and how this phenomenon is improving businesses worldwide. Jim Warner: Seeking complete balance in your life? STOP! Jim explains why it's a myth that can never be fully achieved. Rather he gives you 5 key steps to coming as close as possible to restoring balance. Richard Koch: Here it is, Richard's Secret to Success: Be INTELLIGENT and Be LAZY! Believe me, once he explains his secret, you'll see the world in a whole new light. Featuring Dan Sullivan, Joe Caruso, Thomas Moore, Ph.D., Shannon Duncan, Earl Nightingale, and MORE! Dan Sullivan: Kiss the 5-day, 40-hour workweek GOODBYE! The great Dan Sullivan introduces a revolutionary time system with fewer hours, less stress, yet greater productivity and results. MANY organizations are now adopting this model. Will yours? Shannon Duncan: What if you could radically elevate your everyday experiences? It IS possible once you adopt Shannon's enlightening 3-word philosophy. Accomplish far more with a genuine relaxed effort. Richard Koch: Introducing the 50/5 Principle—once you grasp this powerful principle, your eyes open to a more fulfilling, more successful reality. Plus, Richard finds your elusive Happiness Point. Featuring Paul Pilzer, Ken Baum, John Abdo, Nick Hall, Ph.D., Dr. Michael Roizen, Covert Bailey, and MORE! John Abdo: John illuminates a personal achievement tip that makes your body, mind, and heart stronger... all at the SAME TIME! Dr. Michael Roizen: What's your REAL age? Despite your true age, your body, mind, and vital organs may be aging prematurely as a result of 3 deadly—but VERY avoidable—causes. MORE author interviews, MORE laughs. For almost 60 years, Nightingale-Conant always made it a point to listen to what our customers want. After an overwhelming response to our first Personal Insight Library, we heard from many customers. The letters and emails were similar—people loved it and thirsted for MORE! They benefited from our product so much that they asked us to publish another one. We listened... and we immediately began working on a program that included even MORE achievement ideas and even MORE inspiration and motivation. In short, we wanted to exceed your expectations. And I believe we've done just that. Featuring Jim Harrick, Michael LeBoeuf, Ph.D., Dr. John Elliott, Ph.D., Dr. Charles Garfield, and MORE! Steven Pressfield: It's the most toxic force on the planet causing more disease and poverty than anything else. And it's eating at you RIGHT NOW! Rid your life of it today, and you'll have a lasting advantage for peak performance. Michael LeBoeuf, Ph.D.: Learn a valuable hidden secret that impacts your prosperity and productivity. Even more, Michael presents 10 specific choices anyone can make to escape the time-money trap. John Elliott, Ph.D.: Ready to gain the mind of an ultra-achiever? Simply think like a SQUIRREL! Sounds ridiculous, I know. But Dr. Elliott proves it leads to an entirely new realm of performance. Featuring Mark Hyman, M.D., Gary Null, Ph.D., Dr. Carl Aylen, John Wasik, Jerrold Mundis, and MORE! Mark Hyman, M.D. : Increase your lifespan by ONE-THIRD—from dying at age 66 to living to 99—by doing just ONE THING! Yes, it's doable. Plus, Dr. Hyman hands you the fountain of youth—the key to STOP premature aging. John Wasik: Will your money last throughout your retirement? Yes it will! John gives you several tips to ensure that your money lasts as long as you do. Jerrold Mundis: Discover the final word on getting out of debt and staying out of debt... FOR LIFE! Featuring Dale Carnegie, Marianne Williamson, Tony Alessandra, Ph.D., Thomas Leonard, Robert Allen, and MORE! Dale Carnegie: The legendary Dale Carnegie regards assertiveness as the most important skill in personal relationships. He shares how you'll use your newfound assertiveness to avoid conflict at work and at home. Robert Allen: Increase your level of assertiveness and watch your productivity soar with these 2 vital tips. Plus, he shares the truths about why we procrastinate and how to avoid this time trap for life. Featuring Win Wenger, Ph.D., Brian Tracy, Donna Cercone, Dr. Carl Aylen, Tony Alessandra, and MORE! Donna Cercone: Donna is anxious to share 6 easy ways to tap into your genius mind. Brian Tracy: Welcome to a level of extraordinary performance! All you need to do is use this 7-step method to create a resourceful state of mind... and you're there! Featuring Roger Love, Jim Rohn, Peter Thomson, Roger Dawson, Bert Decker, Earl Nightingale, and MORE! Roger Love: Vocal coach Roger Love tells you how stage fright will actually benefit you! Then he presents sure-fire ways to overcome this most paralyzing fear. Earl Nightingale: From perhaps the greatest communicator of all time... Earl gives you 16 career-rocketing tips to become an effective, commanding speaker. Peter Thomson: Discover the best-kept secrets that all great communicators share. And one key that may rob your speech of power. Featuring Stephen Edwards, Paul Pearsall, Ph.D., Steven Pressfield, Earl Nightingale, Michael Wickett, and MORE! Paul Pearsall, Ph.D.: Imagine becoming stronger, more alive, and even happier AFTER you suffer a tremendous setback! Dr. Pearsall reveals the 6 secrets to invincibility—no matter what life throws your way! Stephen Edwards: Stephen shows how you can actually benefit from fear! Yes, follow his direction and your own fear increases your confidence and gives you an overwhelming power to create extraordinary results! 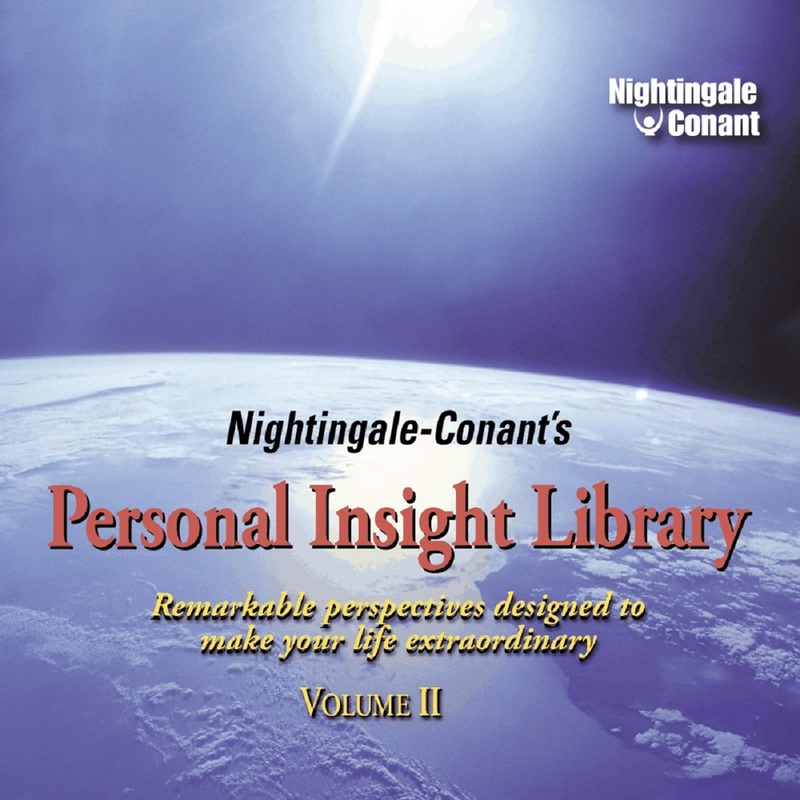 And right now, The Personal Insight Library Volume II is even MORE extraordinary, making this your happiest, most successful, most memorable year. You will turn to time and again for years to come—discovering new insights, ideas, secrets, and strategies every time you listen. I want to master the Five Fundamentals of better living, enabling me to achieve far more with minimal effort and time. I'm ready to hear results-driven insights from 50 of the greatest minds in personal development.